Call today to book your 2019 golf outing. Lose yourself in Coyote Moon Golf Course's tranquil environment. The course seems worlds away from civilization and each hole seems a world unto itself. standards and attentive guest services to create your perfect day of golf. Coyote Moon Golf Course is one of the finest mountain golf experiences in the country. Residing in the beautiful Lake Tahoe area, Coyote Moon sits on 250 acres of secluded rolling hills amidst towering pines, enormous granite outcroppings, wildflowers and the beautiful Trout Creek. The vistas plus fresh mountain air equals near perfection. Without a single home to spoil the view, playing Coyote Moon offers an experience seldom found in golf today. Coyote Moon Golf Course is a challenging but fair test of Lake Tahoe golf. All levels of golfers will be tested, yet all will enjoy their round. Most tee shots offer ample landing areas as there are only a few forced carries. From the landing areas, most holes funnel down to medium-sized, undulating greens that are well protected by trees, sand and water. The golf course was designed by Brad Bell, a former PGA Tour player, well known for creating highly praised golf courses around the central valley. Coyote Moon is located in the historic town of Truckee, California just minutes away from the shores of Lake Tahoe including Tahoe City, Squaw Valley and Incline Village. It is easily accessed from both Sacramento and Reno and is about an hour drive from South Lake Tahoe. 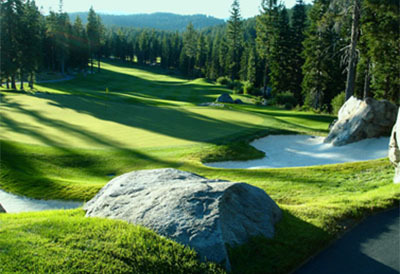 Enjoy Lake Tahoe and Truckee Golf at its best!